My awesome sister over at Touch of Modern got her hands on a Homido VR headset and I’m super excited to share a review with you today! This little headset falls square in between the Google Cardboard and Samsung Gear VR headset, and supports a variety of phone sizes (4″ – 5.5″ recommended, but limited support up to 5.7″ according to the box). I tried it with my Nexus 5, and found the size to work out quite nicely. As far as phone VR goes, this one is hands-down my favorite so far! 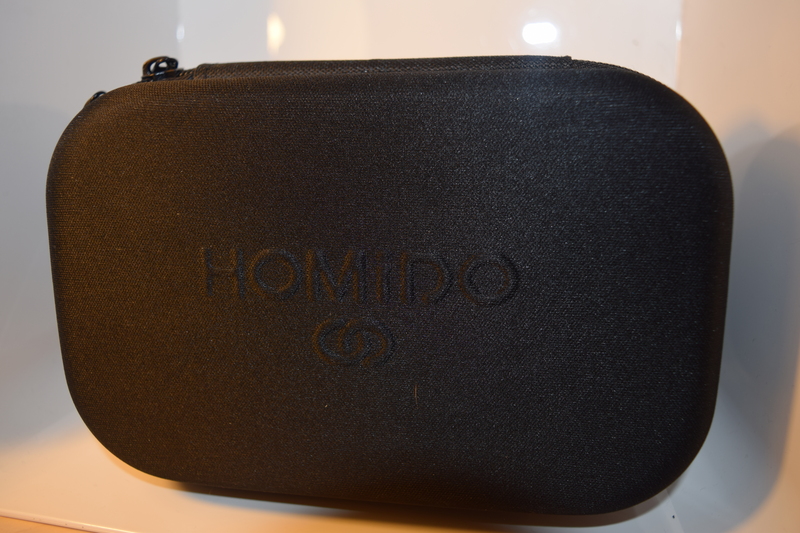 Inside the box, the Homido comes with two additional sets of lens holders, similar to the how the Oculus Rift DK 2 comes with a separate set of lenses for near/farsightedness. There’s also an optional over-head strap that comes with the headset, so you can choose whether or not to add the extra support when you test it out. There’s also a really sturdy carrying case, which is definitely handy if you’re like me and take your VR headsets out and about often. Officially, the Homido headset supports Android and iOS, but I’m not sure whether or not there’s actually anything that prevents it from being used with other phones – I plan on testing out my Nokia 820 Windows Phone to see how it works with that – and you can test whether or not your phone is “compatible” (meets their recommended requirements) with QR codes on the back of the box. They do mention that there are limited apps for WP, so it looks like at least internationally, it’s starting to get interest on all platforms.The Homido is currently retailing for €69 (~about $79 USD, at the time of this post) but ships from France so there’s an additional €12 shipping fee and import tax for a total of €81 ($93 USD). I was lucky enough to get gifted this headset and had a chance to play with it today – and I am actually really impressed by it. 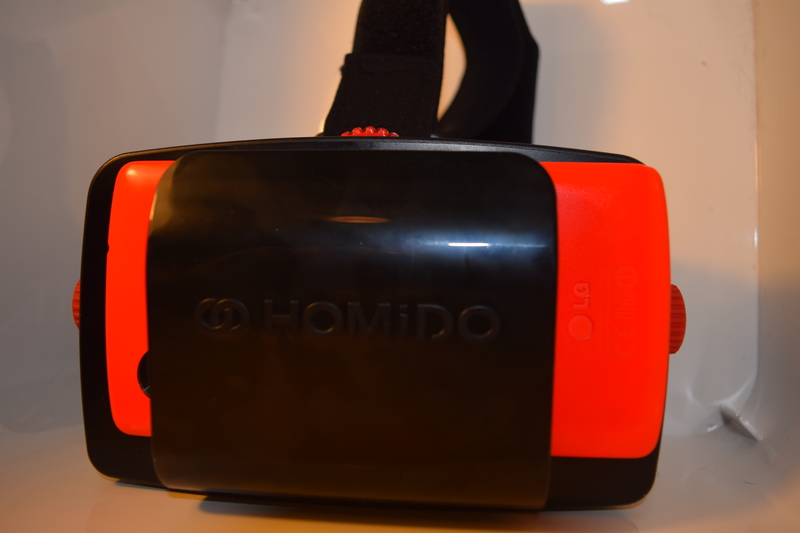 The Homido VR set is lightweight, but the plastic material feels really solid and my phone fit in very securely – the front of the headset has a large clip-like piece to hold the device in place. What really stood out to me about the headset was how easily it was to adjust – there are three different dials (two on the front, one on the top) that adjust to different size phones. I have a notoriously difficult time getting the lenses on the Oculus to adjust, and the Google Cardboard doesn’t have an adjustable lens, so this was a nice change of pace with other HMDs I’ve used. In terms of usage, the Homido lenses led to a crisp look on the display – it was really clear and easy to read text on the phone screen, and images were crystal clear. The head tracking was responsive and the headset itself was really comfortable – there wasn’t too much light coming in from outside of the headset, and the light weight helped with how it rested when I was wearing it. 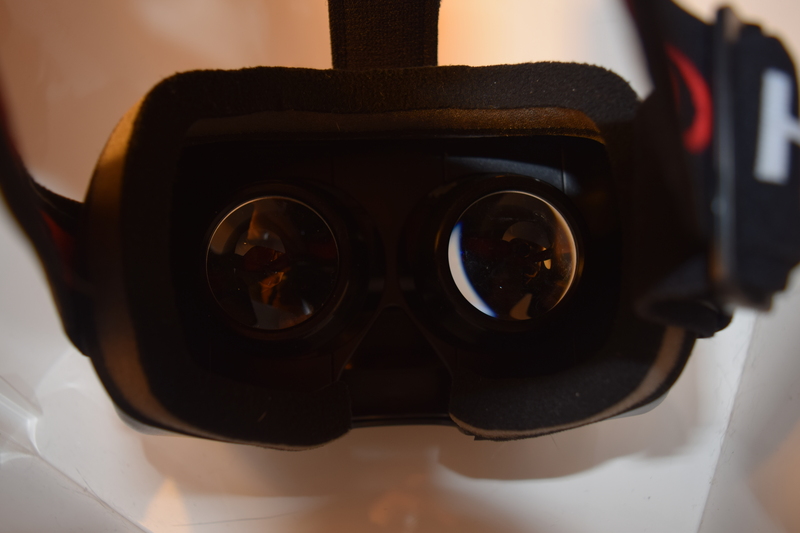 The only downside is that there’s not an easy mechanism built in to the VR headset to interact with the phone – unlike the Cardboard or Gear VR, there isn’t actually a separate button to click to select different options, so it needs another input device to really work – but since most experiences need more than just one button anyway, with a bluetooth controller, it actually seems like it would be pretty solid. So why is this one my favorite? Out of the box, the Homido did the best job of being accessible for mobile VR: I didn’t have to assemble it (although I personally loved building the Google Cardboard) and I don’t need to have one particular type of phone to use the headset (I’m looking at you, Samsung!) Of course, as is true with all mobile VR, the experience isn’t as great as the desktop Oculus Rift, but the Homido was comfortable and good enough that I was actually motivated to get my bluetooth controller out and give it a real spin – and this will definitely be the one I take with me when I travel to show people the potential that VR has right now. It’s comfortable, lightweight, small, and great quality for the ~$100 price tag, half the price of the Gear VR right now, though that lack of a button is a little bit of a pain. Right now I’m in the process of charging my controller and downloading some new apps for my Nexus 5 to take it for a full spin – stay tuned! 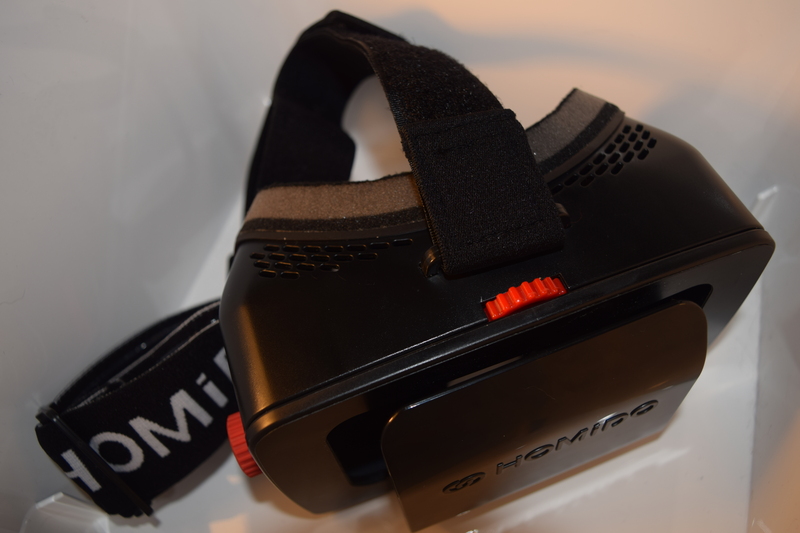 Have you tried the Homido headset, or other mobile HMDs? Which have been your favorites so far?